October 7 (Wednesday, 8:30 a.m. to 2:30 p.m.) National History Day Workshop for Educators. 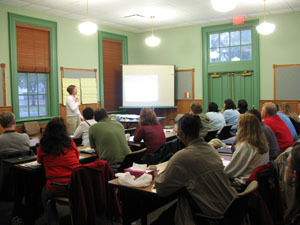 The Oberlin Heritage Center and the Ohio Historical Society are offering a full-day workshop for local educators at the Oberlin Depot (240 South Main Street) for teachers to learn more about the History Day Program, see examples of projects, meet fellow advisors, and get helpful tips for guiding student research. State History Day staff will lead educators through a day of activities to learn about the National History Day program and how to create effective projects. Learn about interpreting primary sources, analyzing historical topics, and selecting topics and activities specific to the theme of History Day for 2010: Innovation in History: Impact and Change. Registration includes continental breakfast, lunch, and materials. Participants also will visit the Oberlin Heritage Center to see how teachers and students can use local history resources to research and create History Day projects. Further details can be obtained by contacting Megan Wood, the History Day State Coordinator at mwood@ohiohistory.org (614-297-2343) or Liz Schultz of the Oberlin Heritage Center at tourinfo@oberlinheritage.org (440-774-1700). Register online through the Ohio Historical Society.